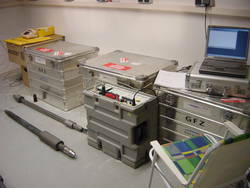 Most of our logging instruments are operated with the data acquisition software Geobase (Antares). The acoustic imager is run with the SCOUT system (ALT). 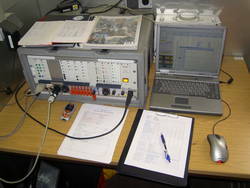 The very small and lightweight data acquisition systems GEOBASE and SCOUT both consist just of a laptop and a hand portable tool interface panel. The Antares sondes deliver original raw logging data in the RLF-format that can be read with Geobase only. Output in ASCII and LIS/DLIS is possible. 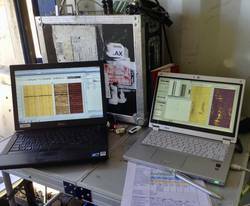 The SCOUT system delivers data in the TFD format and via WellCAD output in DLIS is possible. The SlimWave geophone chain is operated with WaveControl/ToolsPilot (Sercel). We mainly utilize the WellCAD (ALT) software for data processing and some special modules of Geobase. WellCAD generates its own plot file formats. These can be viewed with WellCAD Reader which can be downloaded free of charge. Data output file formats are ASCII, LAS and DLIS. The KTB/GFZ developed software CREOS is used for a semi-automatic matching of core and log structures for spatial core orientation purpose.